Humboldt County District Attorney Maggie Fleming will formally ask the state Attorney General’s Office to handle prosecution of the David Josiah Lawson case going forward. In the release, which was also a response to Charmaine Lawson, Fleming stated: “I agree with Ms. Lawson that any future prosecution should be handled by the appropriate state-level agency." However, she added that the Attorney General only takes on prosecution of cases if there is a conflict of interest for the current agency. She added that the AG previously decided not to take on the case because it found no conflict of interest in Humboldt County’s District Attorney’s Office, however, she has decided to formally ask the AG to take on prosecution of the case due to public perception. Fleming cites “misinformation” from media coverage as the prime source of the public's suspicion about a conflict of interest. “How has the perception of a conflict of interest developed? In part through media coverage that has given extensive exposure and credence to people who have provided misinformation,” Fleming wrote. 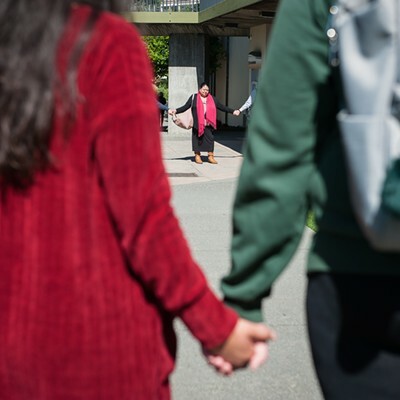 Charmaine Lawson, mother of the Humboldt State University sophomore who was fatally stabbed at an off-campus party in April of 2017, issued a statement yesterday criticizing the Arcata Police Department's handling of the homicide investigation, calling it "beyond negligent." She also urged Fleming to ask the state Department of Justice to intervene in the case. A McKinleyville man, Kyle Zoellner, was arrested at the scene of Josiah Lawson's stabbing and charged with his murder but a Humboldt County Superior Court judge dismissed the charges against Zoellner a few weeks later, saying prosecutors had insufficient evidence to hold him to stand trial. APD continued investigating the case and again turned it over to the Humboldt County District Attorney's Office in November, with then interim Police Chief Rick Ehle saying detectives had found "unequivocal physical evidence" linking a specific suspect to Lawson's death, but on March 13 prosecutors announced that a criminal grand jury had decided not to indict "any persons" in the case, which has now been sent back to APD for further investigation. The example Fleming provides in her release refers to Ehle's statement. She went on to say, "When asked about that statement by the District Attorney’s Office, Mr. Ehle claimed to have been misquoted. The distribution of misinformation about ongoing cases is unprofessional, potentially cruel and damaging to people involved, and contrary to the pursuit of justice." Fleming also responded to Lawson’s request for the criminal grand jury transcripts, saying her office is legally unable to provide them. Fleming further points to complicating factors regarding the DNA evidence, noting, "simply finding the DNA of a person known to have been bloodied in an altercation on a weapon associated with that altercation provides little or no new information about the incident," and that "DNA from multiple contributors can complicate the interpretation of DNA evidence." Several media outlets are reporting that a Superior Court judge ruled today there was insufficient evidence for the mother of a teenage accused in the fatal stabbing of another boy to stand trial for murder. According to the Times-Standard’s article, Judge Gregory Elvine-Kreis said the prosecution’s argument that Lorna Jean Leen “acted with ‘implied malice’ or ‘aided and abetted’” her son in the killing was not established. Leen and her son, who is being tried as a juvenile, were arrested Aug. 10, the day after 16-year-old Brandon Brocious was found fatally stabbed in the Ocean View Cemetery. 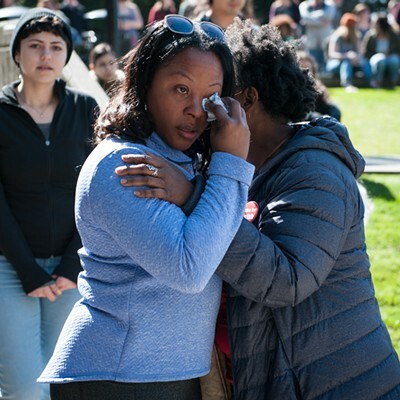 Charmaine Lawson is hugged by supporters shortly before addressing students, faculty and the community on the HSU Quad on Friday, the 23-month anniversary of the killing of her son, David Josiah Lawson. Red hats, scarfs and sweaters enveloped the exterior of the Humboldt County Courthouse and “Justice for Josiah” and “I stand with Charmaine Lawson” signs sat on the steps, as Lawson began to speak. 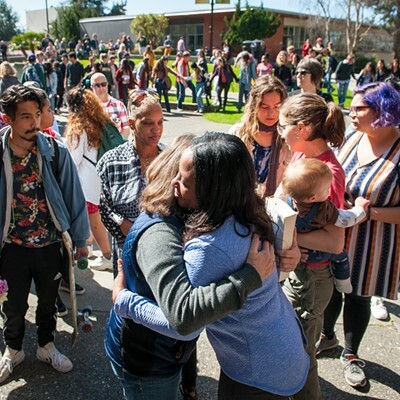 Lawson’s son, David Josiah Lawson, a 19-year-old Humboldt State University sophomore, was fatally stabbed at an off-campus party April 15, 2017, reportedly after being in at least two physical altercations with a 23-year-old McKinleyville man, Kyle Zoellner. Zoellner was arrested at the scene but a Humboldt County Superior Court Judge dismissed the murder charge, finding there was insufficient evidence to hold him to stand trial. According to the press release, the grand jury made up of 19 jurors convened on Feb. 28 and heard testimony from 25 witnesses, including forensic experts and DNA evidence. The decision was later met with protest as a dozen people headed to the steps of the courthouse that night. Zoellner’s attorney also sent out a press release on his behalf, which you can see here. The Friday night protest began with a song, “Amor Eterno,” played by Octavio Acosta, an HSU student. 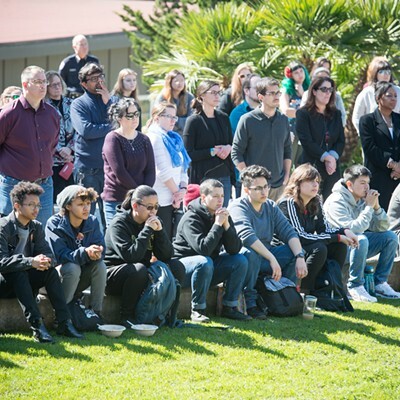 Then speakers, including Lawson, Eric Rydberg, Michihiro Clark Sugata, Mike Fennell and Shemya Vaughn, talked about their frustrations with the case and called for the community to make change and demand justice. Fennell, who has grown close to the Lawson family and attended the preliminary hearing in the case, asked the white community to use its privilege to make change and also expressed the idea of recalling Humboldt County District Attorney Maggie Fleming. The crowd cheered. 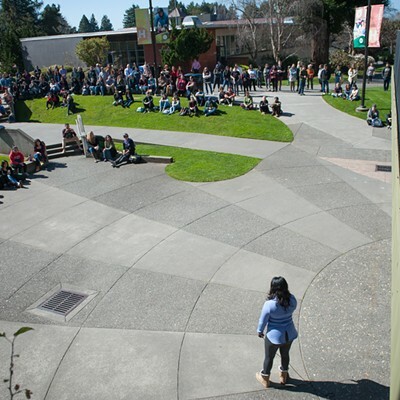 Humboldt State Student Janaee Sykes speaks to the crowd as Charmaine Lawson holds her hands. She then asked one of them to speak. Janaee Sykes, an HSU student and an acquaintance of Josiah’s, told the crowd to continue to fight for Josiah. Earlier in the day — in what was her first appearance in the county since the grand jury’s decision — Lawson had gone to HSU and spoke on the university quad about Fleming’s handling of the case..
HSU University Police Chief Donn Peterson listens while Charmaine Lawson speaks of her son. In the quad, people were wiping and sniffling back tears as Lawson spoke about her son and told them stories about his character. 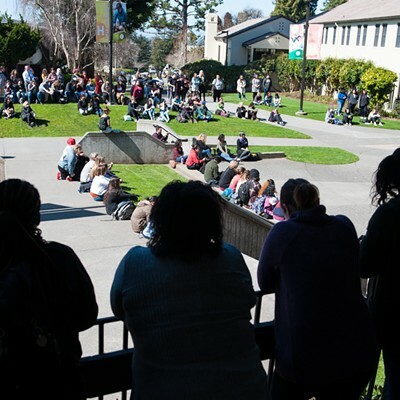 Among the crowd stood HSU President Lisa Rossbacher, who, according to Lawson, called her Thursday and voiced genuine frustration and anger about the grand jury’s decision. Lawson then told the retiring Rossbacher not to abandon her son in the time she has left as president. She also urged the crowd to continue to fight for Josiah. After a criminal grand jury targeting him opted not to issue an indictment, a McKinleyville man suspected in the stabbing death of David Josiah Lawson hopes the jury’s decision “will allow law enforcement to investigate the case from a new perspective and seek the truth,” according to a press release from his attorney. 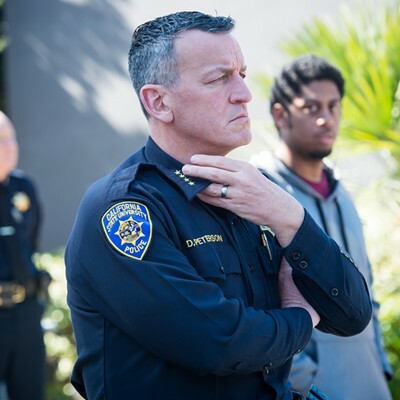 Since Arcata police arrived at the scene of a chaotic house party before dawn on April 15, 2017, to find Lawson, 19, bleeding from a multiple stab wounds, including one to the heart, Zoellner has been the prime suspect. Bloodied and bruised, reportedly from at least two separate fights with Lawson and his friends that night, he was arrested at the scene and charged with Lawson’s murder. But just weeks later, a Humboldt County Superior Court judge dismissed the case, finding prosecutors had failed to present enough evidence to hold him to stand trial on the charge. Aunna Bowllmann holds a sign in front of the Humboldt County Courthouse yesterday, protesting a criminal grand jury's decision not to indict anyone in the unsolved killing of David Josiah Lawson. 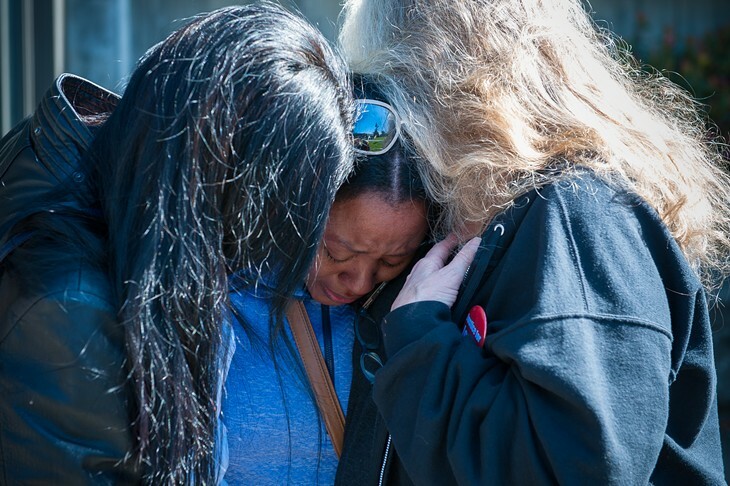 The mother of slain Humboldt State University sophomore David Josiah Lawson says she won't give up in her quest to find justice for her son, despite yesterday's announcement that a criminal grand jury convened in the case declined to hand down indictments. A vigil is planned to commemorate the 23 month anniversary of Lawson's death tomorrow evening in front of the Humboldt County Courthouse. Charmaine Lawson said she plans to attend the vigil and hold a press conference in the near future. 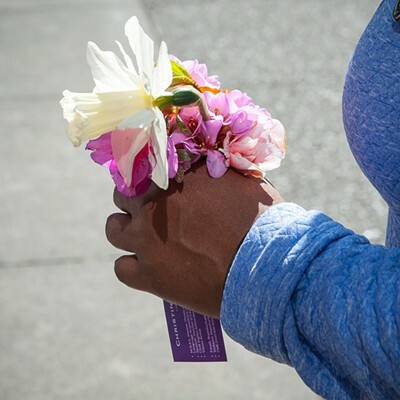 Lawson, a 19-year-old HSU sophomore, was fatally stabbed at an off-campus party in Arcata on April 15, 2017. Kyle Zoellner, a 23 year old McKinleyville man, was arrested shortly after the stabbing but a judge later dismissed the murder charge facing him, citing insufficient evidence to hold him to stand trial. 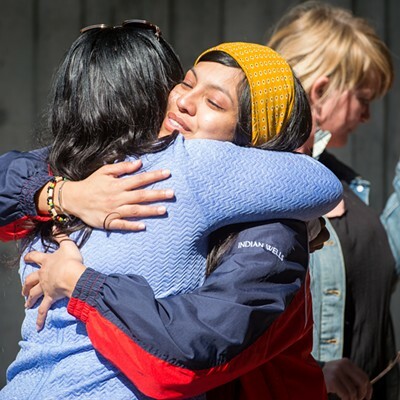 Yesterday, the Humboldt County District Attorney’s Office announced that a criminal grand jury decided not to indict anyone in connection with the stabbing after hearing testimony from more than two dozen witnesses. The Justice for Josiah campaign sent the Journal a statement calling on community members to join the organization in front of the courthouse tomorrow at 5:30 p.m.
“If you are outraged, angered, saddened, numb or disheartened by the recent grand jury decision, take these emotions and propel them into action with us,” reads the statement, which is copied in its entirety below.